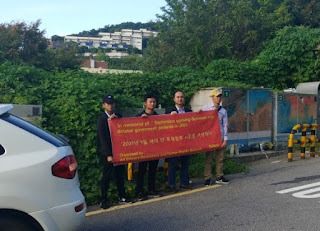 We are a group of ethnics people from Myanmar based in South Korea. Our organization’s name is the All Ethnics Democracy and Human Rights Network. 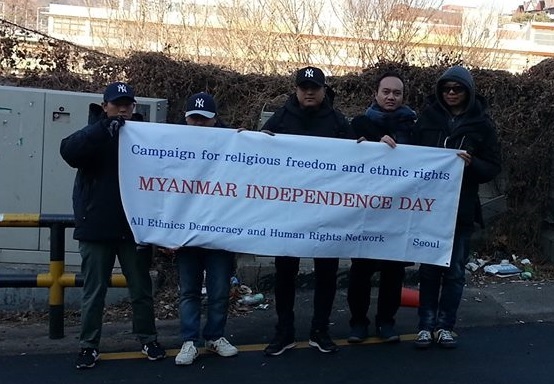 Today we are holding a pro-democracy and ethnic-rights demonstration in front of the Myanmar Embassy, in the event of “71th Myanmar Independence Day. In January 4, 1948, Myanmar achieved an independence from Britain. Where many of innocent people were killed by British oppressor during colonization. Unfortunately, after independence, Myanmar is once again ruled by military oppressor. We, the All Ethnics Democracy and Human Rights Network strongly condemn the Myanmar military for crime against humanity and human rights violation. Myanmar military is even worse than British colonizer in many cases. Although current new government promised to promote democracy, but the ethnic minorities of Myanmar are still threatened more than other sectors of the population. There are continued conflict between ethnic groups and the military along the border areas of the ethnic regions. Moreover, religious conflicts are occurring across the nation where Buddhist majority abused minority religions including Christian in a Christmas eve. Therefore, we, the All Ethnics Democracy and Human Rights Network, demand that the Myanmar military ruler: The political issues: 1. Stop military interfering in civilian government. Remove 25 % military seats at the parliament which guaranteed by the constitution. 2. We opposed the name as another “Panglong Conference,” because it's not necessary and nor relevant. 3. Immediately cease its human rights violations and religious repression in the peripheral of the country. We are a group of ethnics people from Myanmar based in South Korea. 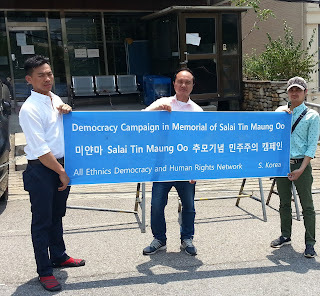 Our organization’s name is the All Ethnics Democracy and Human Rights Network(AEDHRN). 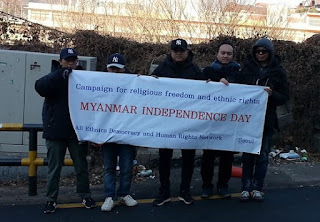 Today we are holding a pro-democracy and ethnic-rights demonstration in front of the Myanmar Embassy, in the event of “11th anniversary of September uprising” against military government in 2007. Today marks the 11th anniversary of the “September uprising” which started in 2007. Where many of innocent people were killed by Myanmar military junta, including monks and activists. We, the All Ethnics Democracy and Human Rights Network strongly condemn the Myanmar military junta for crime against humanity and human rights violation. To build a genuine democracy and stop Ethnic conflicts in Myanmar... Today we are protesting in the front of Myanmar embassy, in memorial of our student leader - a hero ‘Salai Tin Maung Oo’ who was deliberately killed by Myanmar military junta due to his democracy and freedom movement. This is the memorial of 42th anniversary of Salai Tin Maung Oo assassination, that Myanmar’s military junta murdered him on June 24, 1976. We “All Ethnics Democracy and Human Rights Network” are strongly condemned for the Myanmar military government’s action for that. The political issues: 1. Admit and apology for killing Salai Tin Maung Oo 2. Stop military interfering in civilian government. Remove 25 % military seats at parliament which guaranteed by the constitution. 3. We support current government to organize “Peace Conference” with all relevant people participation. 4. We opposed the name as another “Panglong Conference,” because it's not necessary and nor relevant. 5. Immediately cease its human rights violations and religious repression in the peripheral of the country.